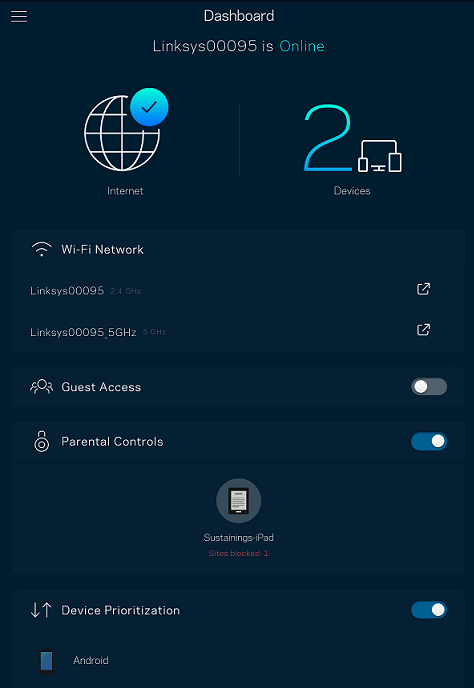 The Linksys app allows you to monitor and manage your Linksys Smart Wi-Fi Routers and Linksys Velop. With the Linksys app, you can access your home network anywhere, anytime. Easily tap into your home network to check the connection status of your devices, set up Wi-Fi access for guests or restrict your kids from accessing social networking sites when they should be doing homework. You can even choose which device gets priority bandwidth to reduce lag times and buffering on your network. You no longer have to be tethered to your desk at home to manage your home network. Get the freedom to access and control your connected life, wherever you are. The Dashboard is the landing page of the Linksys app. It displays how many devices are connected to the network and whether the router is connected to the internet or not. Linksys Smart Wi-Fi Router or Linksys Velop. To know more about the Linksys Smart Wi-Fi Router, click here. For Velop, click here. Compatible with Apple® iOS 9.0 and later. To download from the App Store®, click here. Compatible with Android™ 4.1 and later. To download from the Google Play® store, click here. Remote Access – Access and manage your network from anywhere. Dashboard – Quickly view the status of your home Wi-Fi. Guest Access – Easily grant your friends and family internet access on your separate guest network. Device Prioritization – Prioritize which devices on your network get the most bandwidth for less lag time and buffering. ​Parental Controls – Create a safe internet experience for your kids, even while on-the-go. You can control the usage, restrict access to certain websites or block specific devices from accessing the internet.